A good number of client calls each year start with a question along those lines. You could replace squirrel with bird, rat, gopher, lizard, you name it. Many of us are living so far removed from nature, that we have completely forgotten how life works. The idea that the family dog is a killer, comes as a shock to many. But, dogs are apex predators. That means, they sit on top of the food chain and don’t have natural enemies for whom they are a primary food source. Dogs are the hunters, not the hunted. As such, it is entirely normal for a dog to chase and kill smaller animals. That doesn’t mean your dog is aggressive and will proceed to murdering you or your children in your sleep. You are family. The squirrel is prey. It is also irrelevant if your dog is hungry, at the moment the squirrel comes along. Your dog didn’t chase the squirrel because you didn’t feed enough breakfast. Dogs chase squirrels because they are fun to chase. Dogs tend to enjoy things that assure their survival, domestication didn’t change that. All the things dogs enjoy are part of the predatory hunting sequence: searching, stalking, chasing, fighting, celebration, and consumption. If you want to explore this in more detail, I recommend the online presentation: Tug: A Deeper Perspective. Tell your dog, he is a good boy. Tell her, she’s a good girl. Pet them and give them a treat. They did their job. Have you ever tried catching a squirrel? That is hard work! Let them know you appreciate their work effort. Sounds weird? It shouldn’t! This is the nature of your dog. Domestication didn’t change that. The question behind the question is of course: Is my dog dangerous to my family? Is my dog aggressive? Maybe. Maybe not. The answer depends entirely on your dog but is in no way related to killing a squirrel. Killing other animals is what your dog was born to do. Appreciate their nature. There is no reason to fear it. Aggression is something entirely different. In the canine behavioral world aggression is defined as a forward behavior—assertiveness. But that is not what most people mean when they say their dog is aggressive. People often call aggressive behaviors driven by fear, aggression, or even growling, or showing teeth, and so on. However, none of those indicate aggression. Aggression is the intent to cause injury. But that doesn’t mean any injury caused by a dog is due to aggression. A dog that bites when it is scared, is trying to create space, not injury—the injuries are accidental. Such a dog is not aggressive but can still be very dangerous. 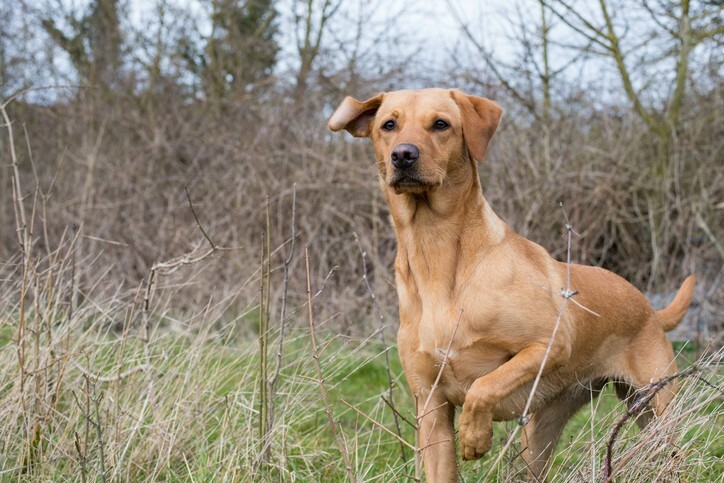 A super-friendly dog with poor bite control—the lack of ability to control how hard they bite—can also very dangerous and may need be muzzled on certain occasions. Aggression is a behavior, not a personality trait. When we call a dog aggressive, what we often mean is, the dog is prone to use aggressive behaviors. We are not our actions. Aggression is not what dogs are, it is what they sometimes do. We can teach dogs to be more aggressive or less aggressive through how we interact with them. Aggression is not genetically driven either, tolerance for frustration is genetically driven. Genetics determine how quickly a dog becomes frustrated and how the dog reacts to that frustration. All aggression starts with frustration. We can affect dogs’ behaviors by helping them manage their frustration and teach them how to handle conflict. However, some dogs love conflict and desire for conflict is also a personality trait. A dog that doesn’t know how to engage in appropriate conflict, will become aggressive under the right set of circumstances. While we can’t take away the desire for conflict, we can direct it in a way that avoids more aggression. In contrast, reactivity is a visceral response without intent. The dog just doesn’t know what else to do in a given situation. As such, reducing reactivity is about changing reactive (automatic) responses into reflective (deliberate) responses—teaching a dog to make better choices. Leashes are a prime example of this. There is no such thing as “leash-aggression.” Leashes don’t make dogs aggressive. That’s a common myth. However, restraining a dog will frustrate it and that frustration can result in aggressive behaviors. In case of a leash, simply teaching the dog to have a better relationship with the leash will reduce the frustration and in return remove the reactivity. True aggression is very rare. Of course, a dog could bite you under the right set of circumstances. However, it’s only a bite if it breaks the skin. A puncture is a bite, a scratch or nip isn’t. Dogs have a sophisticated set of weaponry in their mouths. Their use has been refined over thousands of years. If a dog puts its teeth on you and you don’t sustain an injury, you didn’t get lucky that you avoided injury. You were lucky, that your dog didn’t mean to injure you. You are unharmed because your dog chose not to injure you. Of course, accidents can happen. If you play tug with your dog and get nipped by a tooth during play, that is an accident, and not intentional. Just like we can accidentally bump into someone by mistake, dogs can accidentally scratch or nip you, especially during high-arousal activities. So, what about dog fights? Dogs may engage in a scuffle to shut a barking dog up, put it in its place, or punish it for its behavior. Those are their goals. There is no intent to cause injury in those scenarios, although injury or death is possible regardless. For an altercation between dogs to be a fight, at least one participant must have intent to cause injury. Fights amongst dogs are rare because, in the canine world, fighting is evolutionarily undesirable for survival. Because of dog’s teeth and claws, serious injuries are likely in a fight and even the victor can still die of the injuries an hour later or simply be too weak to protect itself from an even weaker competitor. Fights exert energy and injuries can lead to death. For this reason, dogs are evolutionarily very good at conflict resolution and conflict avoidance. It’s in their best interest to avoid fights. Dominance is one of the strategies to avoid fights. Dominance is ritualistic displays to settle disputes over resources while avoiding fighting—fighting comes at a huge risk. Therefore, the term “dominance aggression” is technically incorrect. Dominance is a posturing behavior to avoid fighting. Dominance ends the moment a fight starts. Fighting is aggression in action. Dominance behavior between dogs is only a problem if it is not responded to appropriately. If one party backs off during posturing, there will be no fight. Ralf Weber is a certified dog trainer and behaviorist. A professional member of the International Association of Canine Professionals (IACP), an AKC evaluator for Puppy S.T.A.R., Canine Good Citizen and Community Canine certifications, author of the dog behavioral book: "If Your Dog Could Talk" and owner of the dog training company Happy Dog Training. 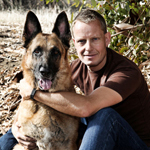 Ralf works with clients in Southern California and can be contacted through his website at HappyDogTraining.info.